I've found that it's pretty easy to find printables for the younger boys. There is a plethora of preschool worksheets out there, and early elementary worksheets abound, but once students start advancing to the middle and upper grades, the options rapidly start to fall off. 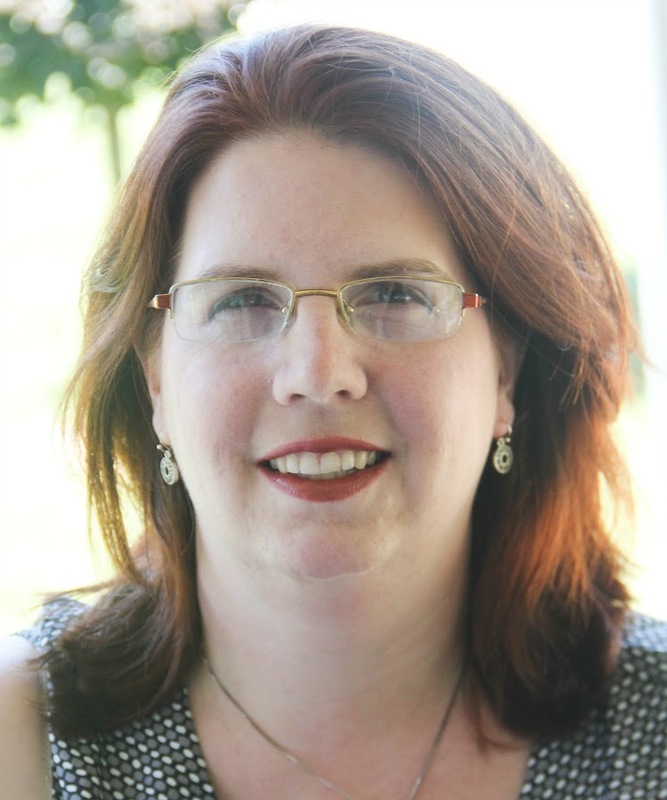 I would not call us any one particular style of homeschooling family, but if I was pressed to pick the ones we gravitate towards the most, I would say we are Classical-meets-Charlotte Mason. This means we use a lot of books and programs that are not typically part of a curriculum, so finding study guides and tests is a challenge. (I know some homeschoolers don't like to worry about grades, but colleges like them on high school transcripts.) Thanks to the Crew, I've discovered HelpTeaching.com and their Pro Plan. It makes evaluating the boys' progress so much simpler. The site is really easy to navigate. There are three main sections: Tests and Worksheets (pre-made pages), Test Maker (create your own tests with either database questions or your own), and Test Room (and online assessment platform). Although HelpTeaching.com is designed for students from K-12, I found us using it mainly for Luke (grade 12) and Matthew (grade 9). I absolutely love this section. Pre-made printables can be browsed by grade and/or subject. Looking for Algebra worksheets? Biology? Easy! Click-click-click-print. Now, not every single topic is available in a pre-fab test, but look at this variety, just for US History alone. Whether your student is looking for additional practice/information, or you need to assign something to evaluate and grade, there is an almost overwhelming amount of information. This section really helped us with literature. Luke has chosen to do an intensive study in Shakespeare for his senior literature. I needed a way to evaluate that he had actually read the plays, and could discuss them. I could have found a generic literature study guide, but I didn't want all fill in the blank quizzes. I think it's important for high schoolers to work in short-essay formats, supporting answers with critical thinking rather than one or two words. 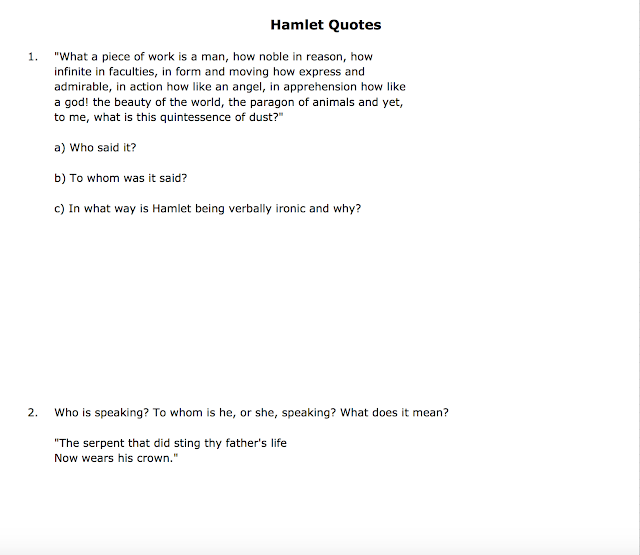 One of the tests Luke is using is for Hamlet. This sample from the test shows that it's a very open-ended format. 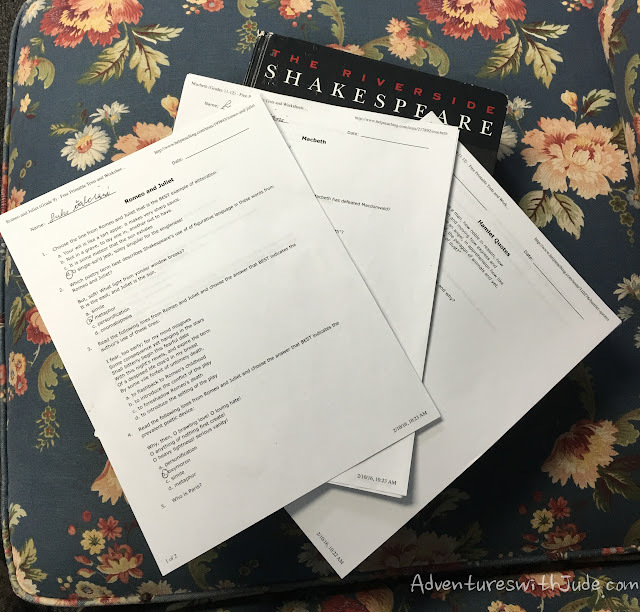 However, because he is reading so many plays, and would like to actually graduate this spring, I did opt for a multiple choice test for Romeo and Juliet. Not every Shakespeare play has a test, but the major "high school" choices are represented. In addition to the pre-made pages, there is a section where you can create games: Bingo cards (numbers and words) and Word Searches. Jude loves word searches. We recently did a unit study on Mau Pilaug, a famous palu who proved that the Polynesians sailed without instruments. I was able to create a word search for him, entering in vocabulary words. 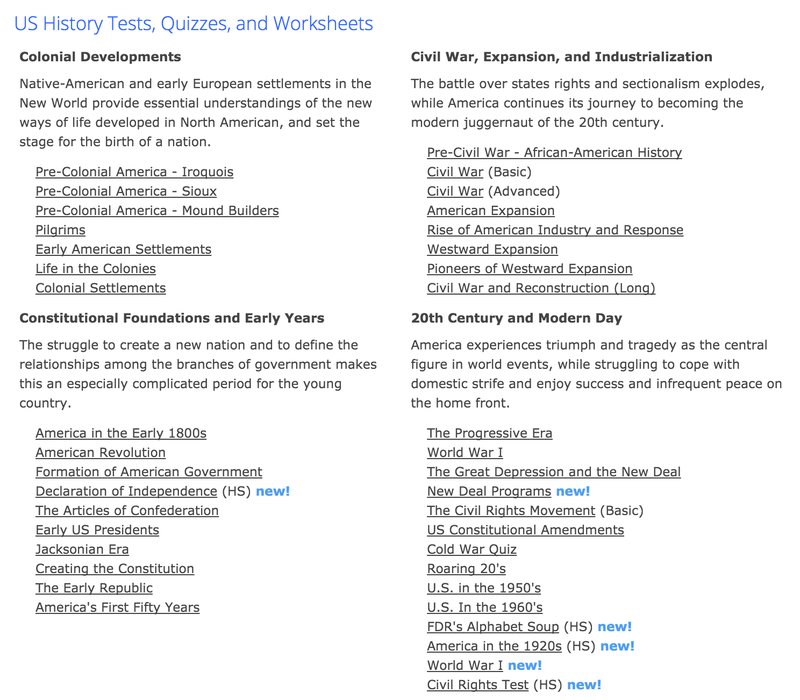 In addition to these printables, there is also a sub-section entitled "Online Lesson". 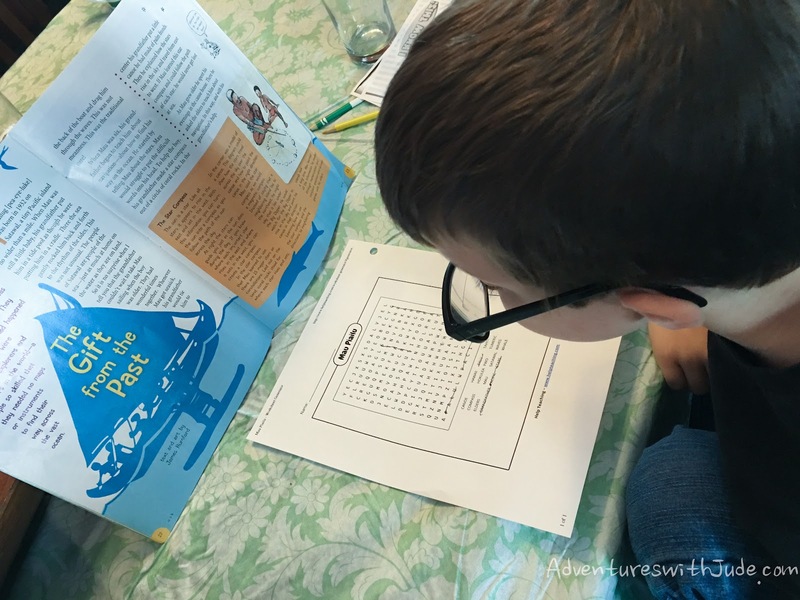 It provides topical lessons (about 30-60 minutes) that combine background reading, evaluation questions, and instructional videos in math, sciences, and language arts. 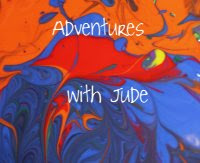 (Videos are sourced mainly from Khan Academy, Educator.com and Bozeman Science.) I think it would be difficult to create a full program out of these - they don't have the depth and quantity that you would need to create a credit-worth course. However, they are usable as supplemental instruction or mini-unit studies if you are doing a self-created curriculum. This is probably my most favorite resource. Luke's senior science is a video-based Anatomy and Physiology course. The source company is upfront that there is no homework or testing to accompany it, because it is an audit-style college level course. I had no qualms about that course being sufficient to earn a full credit with, but I'm still back to the question of "How do I prove on a transcript that he knows what he learned?" I have to say I was shocked to be able to simply "throw together" an anatomy and physiology final. I never thought I'd utter that sentence! I really appreciated having a huge database of questions to put together into an exam. I was able to use the course syllabus from Luke's videos to make sure I was asking him appropriate questions. It made that course so much simpler for me, because who really wants to have to "make up" an anatomy and physiology final? I also like that I can come back to print out the answers AFTER he's taken the test. While I do trust him to not peek at a Teacher Key, not having it on the table or in the folder helps take that temptation away. 1. I don't have to make a test in one sitting. We all know how crazy life gets. I like that I can add some questions, the go back and add a few more if I see other topics to add in. 2. Now that I've made the test, Luke can take it...and (assuming membership maintenance) so can Matthew in few years. I don't have to re-invent this wheel! Yay! This is an area that I admit we haven't explored so much. From what I've ascertained, the parent chooses tests/worksheets from the pre-made section, and then assigns them through an online portal. 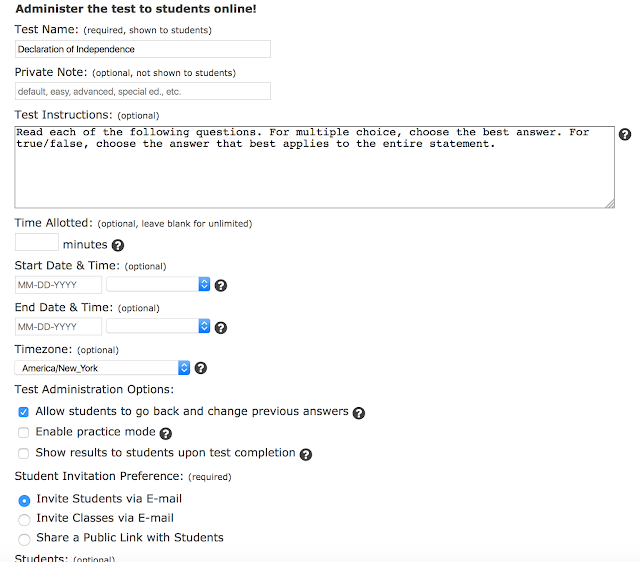 This keeps questions, answers and grades online, rather than having papers floating around. This might be a good option for a group membership/co-op, but I found it was just as easy to print a test and give it, since I was marking the grades down by hand anyway. The biggest drawback to the site is there is no "search this site" option. For example, there are tests for at least three Shakespeare plays. However, it took checking under Grade 10, Grade 11, Grade 12 for the quizzes. I would have much preferred a way to look for "Shakespeare Plays" and find them aggregated into one query return. Had I not kept clicking back and forth, I might not have found them all. It wasn't impossible to find things; it just was clunky to have to sort through several pages. 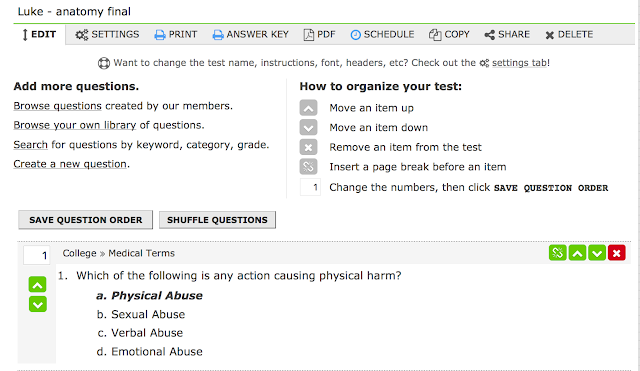 Overall, we really found HelpTeaching.com a big help for creating evaluations for the bigger boys' courses. 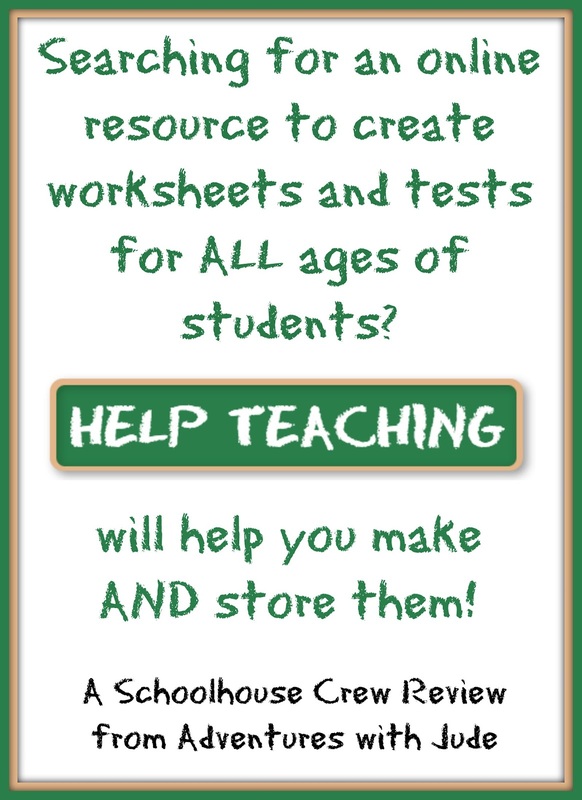 This is now our fourth year as Schoolhouse Crew reviewers, and while we've gotten to use many different programs, we only have renewed memberships to online programs a handful of times. This is one that I can see us purchasing a membership to when our current one expires. It's wide range of content, plus the ability to personalize it for our needs, makes it an excellent resource for getting "what he's learned" quantified onto a transcript.